Kitchen knives are no doubt one of the most essential tools in your kitchen. After al, they are responsible for preparing ingredients; cutting, chopping, slicing and mincing meat, fruits and vegetables. But the thing is, not every kitchen knife is created equal. Which is why we made it easier for you by listing these best kitchen knives for different uses. True to its name, Tefal Comfort Touch range of knives are specially designed for easy handling. This is particularly evident with its soft-touch ergonomic handle, making it useful for those who suffer from arthritis. Beginners are not to be left out as well, given the fact that the Santoku knife is generally known for its all-purpose uses. Not to mention the knife itself is a versatile kitchen tool worthy of your investment. This is because “Santoku” , meaning “three virtues” can perform the following abilities: chopping, dicing and mincing. The knife is also made from a high-quality stainless-steel blade, a material known for its long-lasting durability and particularly resistant against rust and corrosion. Let’s face it, knives can be dangerous if we are not careful enough. With that in mind, this Tefal Comfort Touch slicing knife comes with a sheath cover for easy storage whenever not in use. It also gives you peace of mind, particularly if you have kids at home. As for the knife itself, the Tefal Comfort Touch is ergonomically designed that gives you a well-balanced grip regardless of slicing meat, poultry and vegetables. And since the blade is made from top-quality stainless steel, you can ensure your knife will last long for years to come. The New York-based Farberware is a well-known kitchen appliances brand that has been around since 1900 (that’s more than 100 years ago!). They also responsible for EdgeKeeper range of knives, which are specially designed to prolong the blade’s lifespan. With that comes easy maintenance of utmost performance upon multiple uses in the kitchen. This is, of course, made possible with its built-in mechanism found within the self-sharpening sheath. It basically works by honing the knife’s edge each time you remove and replace it back into the sheath after uses. The knife itself is durable and sharp enough for all kinds of general kitchen uses, thanks to its high-quality carbon steel material. It’s no secret that wood is traditionally used as a knife handle for centuries. They are known to be durable and are generally comfortable to hold. If you wish to have such a knife, one that uses a wooden handle is the KitchenPro 8” Asian Cleaver. Made from a blend of carbon and steel, the cleaver is suitable for performing all kinds of kitchen works such as chopping meats and dicing root vegetables. The handle itself is ergonomically designed, ensuring comfort and ease of use each time you use the cleaver. This homegrown Filipino brand is known for its wide range of kitchen appliances and cookware products made affordable for every kitchen user. Take this knife block set for example. 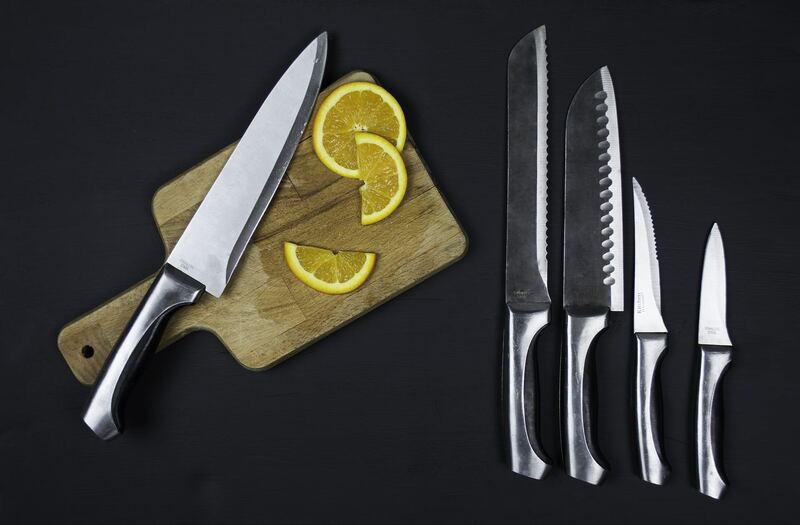 It comes with six essential set of knives for different uses and a high-quality knife block made from stainless steel. Blessed with a minimalist design, the stainless-steel knife block itself is aesthetically pleasing enough to suit most modern kitchens. And given its top-quality stainless-steel material, it also helps to protect your knives against rust and corrosion. First things first, ever wonder why certain knives have holes in them? More than just for aesthetic, these types of knives actually serve their purposes. They help to minimise friction upon the cutting process as well as allowing the knives to be hung easily on a hook after use. The Tefal Comfort Touch Cheese Knife is one that belongs to this category. It has four strategically-placed holes in its stainless-steel blade to ensure easy and smooth cutting, say, on a block of cheese or other dense and sticky foods. The holes in the knife also act as an anti-stick barrier between the food and the blade. A knife bolster plays a significant part to the overall construction and the usage of a knife. In case you are wondering, it actually refers to the thick joint between the handle and the blade. For instance, the Masflex Kitchen Pro 8” Chef’s Knife Power Handle contains an enhanced bolster, which gives you better control and balance upon usage. This chef’s knife is also suitable for multiple kitchen uses such as slicing meats & fishes as well as cutting vegetables. Tired of the same old knife design with a black or wooden handle? Then, you might want to consider this large utility knife that comes with a coloured handle by Tupperware. Available in a bright Margarita or Rhubarb variety, the knife is built to last as it’s made from a high-quality Japanese stainless steel. The large handle design ensures you get a better and comfortable grip, making cutting or slicing meats or vegetables easy and convenient. The Masflex Kitchen Pro 7” Cleaver Knife Power Handle offers the best of both worlds for chopping meat and vegetables. Made from a combination of stainless steel and carbon material, the blade in the cleaver is sharp enough to cut or penetrate through small-to-medium bone of fresh or cooked meat like beef, lamb and pork. Chopping vegetables are just as easy and it is all possible thanks to the unique Power Handle design. It uses triple riveted handle shell to ensure you don’t have to exert too much force during the chopping process. That means the weight of the cleaver will do most of the work, making your kitchen job a breeze. Looking for an all-in-one knife set that provides everything you need for kitchen uses? This Lotus D30970100 kitchen knife set might interest you. It comes with four different types of knives, all made from flash-forged stainless steel. Their particular type of steel used is known to be stronger and less prone to deformity. The set also comes with a sharpening rod, which comes in handy whenever you want to keep your knives in tip-top shape. There’s also an included pair of kitchen scissors, which is suitable for cutting the likes of fresh herbs, root vegetables or trimming food into a desired length. Have you ever come across a knife that has teeth on its edge? That is what we called a serrated knife, primarily used for cutting soft food products with tough crusts like pieces of bread and sandwich as well as able to penetrate through tough skins like tomatoes and pineapples. One such blade that offers a serrated edge is the Masflex Kitchen Pro 8” Power Handle Serrated Knife. It is specially designed for cutting and slicing with ease while the Power Handle to ensures that the weight of the knife does its “heavy lifting”. This means you don’t have to apply much pressure during the process.